During my trip to Rome, I had my sights set on going to Florence for the day – even after my Airbnb host said ‘it would be too short and too tiring’ – nothing was going to change my mind. The trains run frequent and I’d already consulted my Italian ex work buddy Emmanuele, and if he said it was easy, then I knew to trust him (thank you Emmanuele). I’d already booked and paid for my ticket a few days in advance, so all I had to do was find my platform and my seat. I chose a super early 7.45am train. The tickets are cheaper if you book ahead – my return ticket was approx. 60 euros. But, if you know exactly what day you want to travel, it’s even cheaper if you book a few weeks ahead. So, that morning (1st December), I set my alarm super early and headed at 6.30am for the Termini Station in Rome. I had a 50-minute walk, hence my early start. It was a dark morning when I left my cosy home, and walked through the streets, but I was excited at the thought of making this trip. The journey isn’t too long (just under 2 hours), and the ride itself is beautiful. Passing through little towns, and Tuscan fields of trees and fog, I had to resist the urge to get off at a random stop just to take a photo. I thought of my photographer friends who would have loved to have shot with their drone here. It really was special. I arrived into Santa Maria Novella train station on time 9.17am…and oh boy, first though was ‘it’s so much colder here!’. Luckily once you’re in Florence, its small-town feel makes it so easy to travel about from one spot to another on foot. It’s probably one of the most accessible and walkable main Italian cities. 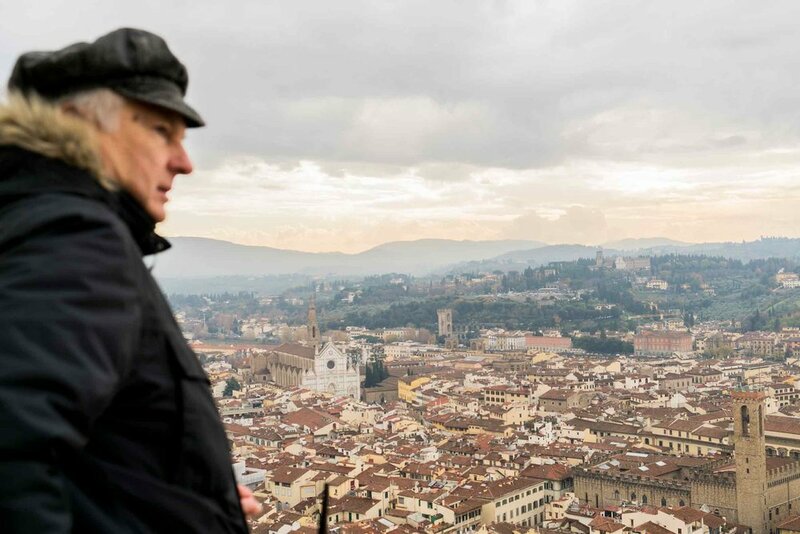 I’d been to Florence before and writing this now, I can still remember what it was like to catch my first glimpse of Santa Maria del Fiore – it was just how I remembered it. Breathtakingly beautiful. It’s one of the most famous Cathedrals in Italy due in part to its huge dome . I had a sense of Deja-vu walking around the cathedral – I circled it twice just to get a feel for its immensity and to see ‘the gates of heaven’- and I remembered the day when mum and I stood watching a religious procession. The weather totally opposite to what I was experiencing this time around – it was sunny, hot and Mum and I were a little shocked at our rather expensive and rather huge £5 gelato! I had to dig out the photos of us on my return. It was September 2011 and I remember it like it was yesterday. It was still early morning, and relatively free from tourists, so I headed to Giotto’s Campanile first as there was no queue. Reliving previous bell tower climbs and also the Leaning Tower of Pisa, I was prepared to work up a sweat. There are 414 steps to reach the very top; it’s unmistakably memorable, and it’s also a symbol – much like the Duomo – of Florence. 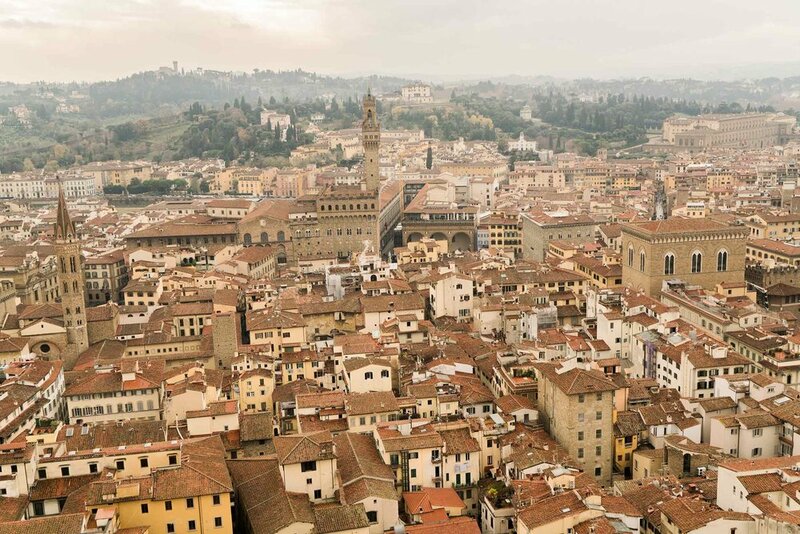 From the lofty heights of the top, you’ll be rewarded by several grand panoramic views of the city, the surrounding hills and of the cathedral and Cupola of Brunelleschi itself. It really is quite beautiful. Rather than taking a teeny rest, I decided there was no time like the present to face the next climb and I headed straight for the Cathedral Cupola…there was a little queue, and I knew if I left it any later the queue would be ten times, if not more long (I was right). After seeing the Duomo from all side and visiting inside, I wanted to see inside the dome and the view, so I booked my time slot, and dodging a rain shower I headed in. My legs were still recovering from the Campanile climb, and silly me didn’t notice the 463 steps to reach the top of the Cupola. It was too late to change my mind, and so up I went. I felt quite proud of my achievement once I’d reached the top, and wow, the view! I thought the Campanile view was a beauty, this was even more spectacular (well, I thought so). Not only do you get a remarkable view of the city from the top, but as you climb, you also get to see a different perspective of inside the Cathedral, and of the stunning and intricate frescoes. It’s something you can’t miss seeing in Florence. Other than the Cathedral, I had no real agenda, I just wanted to walk and enjoy Florence, and that’s exactly what I did. I soon found myself at another spot I remember so vividly…Ponte Vecchio, one of Florence’s oldest and most beloved landmarks. Literally translated as the ‘old bridge’, I love the history and Romantiscm of this bridge. While today the bridge is known for its illustrious jewellery shops, and hanging balconies, the history of this bridge is interesting (to me anyway). Beneath the glitz of gold rings, chains and watches is a bridge that’s stood the test of time. A gold necklace can be bought anywhere, but a gold necklace purchased on the Ponte Vecchio, is not just gold, it’s all in the location that make that item of gold so special. It’s an experience. I was drawn back to the bridge various times that day – I guarantee anyone visiting will be too – the light changes at different hours of the day. The Cathedral is impressive, the museums and galleries spectacular, but for me Ponte Vecchio is my favourite sport; at sun set the bridge literally bathes in gold and at night it twinkles. It’s so completely charming. Another important spot linked to the bridge is the Vasari Corridor – and oh my, when the light hits this corridor all kinds of wonderful shadows, sun beams and magic happens. It’s a long corridor that links the Uffizi Gallery to the Pitti Palace. I had so much fun taking photos here, that I had to stop and make myself head to Piazza dell Signoria and Palazzo Vecchio – Florence’s most famous square. Top tip, unlike me, if you don’t want to just walk and wander, and you do want to tick off some sights, you’re going to have to make yourself a little itinerary. Florence really does hold some of the most magnificent masterpieces in the world. There are the major museums and galleries to visit including the Uffizi home to Michelangelo’s David (plan ahead if you want to visit here. It’s the biggest and best museum, and also the hardest to get into), The Academia, Palazzo Vecchio and Palazzo Pitti, churches including Santa Croce, Giardino de Boboli (I like saying the name Boboli), a market, as well as the many streets (on either side of Ponte Vecchio bridge) and piazzas to get lost in. Not to mention all those energy refuelling pit stops to make in the cafés and restaurants. And, because it was gearing up to the festive season, everywhere had taken on that magic Christmas feel. Sadly, I didn’t have time to visit the numerous art galleries – as you can see from above, there’s enough to keep you busy for weeks on end – as well as beautiful Renaissance churches, buildings and streets. There’s also the view at Pizzale Michelangelo. I was told the view here is a little of a hike up a hill, but it’s a great way to see a stunning view of the city without having to pay to climb the steps of the Duomo.